Obviously banning guns means nothing, absolutely nothing, to those who are determined to break the law. From The Guardian: Police and border officials are struggling to stop a rising supply of illegal firearms being smuggled into Britain, a senior police chief has warned. Chief constable Andy Cooke, the national police lead for serious and organised crime, said law enforcement had seen an increased supply of guns over the past year, and feared that it would continue in 2019. The Guardian has learned that the situation is so serious that the National Crime Agency (NCA) has taken the rare step of using its legal powers to direct every single police force to step up the fight against illegal guns. The NCA has used tasking powers to direct greater intelligence about firearms to be gathered by all 43 forces in England and Wales. 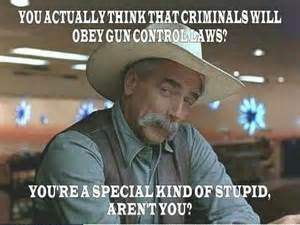 Another senior law enforcement official said that “new and clean” weapons were now being used in the majority of shootings, as opposed to guns once being so difficult to obtain that they would be “rented out” to be used in multiple crimes. The increasing supply of guns belies problems with UK border security and innovations by organised crime gangs. Smugglers have increasingly found new ways and innovative routes to get guns past border defences. Cooke said more are coming in from eastern Europe and the western Balkans and also component pieces are being smuggled in via the fast parcel system, hidden among a growth in packages because of the explosion of internet shopping. Guns are being bought on the dark web and the UK is also seeing weapons designed for sports shooting being smuggled in, as well as blank firing weapons bought for just £100 being converted in the UK. Criminals have also obtained high end automatic weapons such as an AK47. He said shotguns were 40% of the total, with an increase in burglaries to try and steal them. Handguns are the next biggest category, most often smuggled in from overseas, with ferry ports such as Dover being a popular entry point into the UK for organised crime groups: “We’re doing a lot to fight back against it,” Brough said, adding that compared to other European countries, the availability in the UK was relatively lower. Gun crime has been rising and the last set of official figures about recorded firearms offences, showing a 5% fall to 6,362 in the year ending June 2018, is seen as a blip against a trend of rising gun offences. Statistics released earlier in 2018 had shown gun crime up 11% in 2017/18, and in the same period, the Metropolitan police said discharges of lethal barrelled firearms rose by 23%. Compared to 2015/16, there has been a 67% increase in the capital alone. Counter-terrorism sources tell the Guardian that the most likely route for terrorists in the UK to get guns will be from criminals, not by specifically importing them. In a 2016 case, a group of Isis-inspired terrorists led by Tarik Hassane, dubbed “the surgeon”, got a firearm from criminal contacts as part of a plot to stage drive by shootings. The growing supply of guns in the UK, rising year on year according to intelligence reports, alarms those trying to stop a Paris-style marauding gun attack in the UK. They fear the more firearms are available, the easier it will be for terrorists to get them from criminals. Seen on Facebook, this is one of the most heartbreaking pictures I have ever seen. This woman could be any one of my friends and relatives. Please keep her in your prayers, as well as all the people in the path of islamic murderers. If you think ISIS is cool, think again. The fingerprints of Obama and Muslim Brotherhood are all over the dirty work of ISIS. If you voted for Obama, you should be ashamed, because you helped support the first huge genocide of the 21st century. If you defend Obama today, after all we have learned, then there is innocent blood on your hands. Warner Brothers in Burbank CA have begun frantic search for mole in their top secret offices. Stars and Stripes: The 1st Infantry Division headquarters will deploy to Iraq soon as the U.S. military steps up its campaign against Islamic State militants, the Pentagon said Thursday. It will be the first division headquarters assigned to Iraq since U.S. forces withdrew from the country at the end of 2011. About 500 soldiers from the Fort Riley, Kan.-based division will be heading for the Middle East next month with about 200 of them going to Iraq, Pentagon press secretary Rear Adm. John Kirby said. “They’re going to provide command and control of the ongoing advise-and-assist effort in support of Iraqi and peshmerga forces. And they’re going to continue to help us all degrade and destroy ISIL,” Kirby told reporters, referring to the Islamic State by one of its acronyms. The new headquarters personnel will be working out of the joint operations centers in Baghdad and the Kurdish capital of Irbil, as well as the Iraqi defense ministry. An advance element of about 10 soldiers is already in Iraq preparing for the influx of the additional troops, Kirby said. Rick Brennan, Jr., an analyst at the Rand Corporation and former Army officer, said sending elements of a division headquarters and the general officer who will come with it will make it easier to coordinate both with international allies as well as Iraqi and Kurdish forces in the campaign against the Islamic State, which overran about a third of Iraq in an offensive last summer. Brennan said the decision also signals that there will be a significant U.S. military presence in Iraq for the foreseeable future. “I think there’s been recognition that what the United States is doing in Iraq is going to be long term,” he said. Kirby acknowledged that the timeline for the headquarters element’s mission is uncertain. “I just don’t know for how long they’re going to be there or how and when they might be replaced,” he said. The 1st Division said the soldiers were preparing for a one-year assignment. The 200 headquarters servicemembers who will be in Iraq are part of the increase of 475 troops that President Barack Obama authorized two weeks ago. The U.S. has been sending teams of military advisers to assist the Iraqi security forces, many of which have performed poorly against the Islamic State. The other 300 troops from the 1st Infantry will be supporting the command and control mission from outside of Iraq. Kirby did not identify the country where they will be stationed. The deployment of the new headquarters element is just the latest step in an expanding U.S. role in Iraq. The process began three months ago after the Islamic State militant group overran much of the country. On June 16, the Pentagon announced that 275 personnel were being sent to secure U.S. diplomatic facilities as Islamic State fighters marched towards Baghdad. Later that month, President Barack Obama announced that 300 troops would go the country to assess the capabilities of the troubled Iraqi security forces and set up joint operations centers near Baghdad and Irbil. About 200 additional security personnel were sent around that time. On Aug. 8, the U.S. military commenced airstrikes and humanitarian air drops as terrorists threatened to massacre religious minorities near Mount Sinjar. The bombing campaign later expanded to support Iraqi ground forces and prevent the militants from damaging the Mosul and Haditha dams. Two weeks ago, after a new Iraqi government was formed, Obama announced that another 475 troops would deploy to advise and assist Iraqi forces. As of Thursday, 1,268 of the 1,600 American troops authorized to be in Iraq were in country. The Pentagon has also carried out approximately 200 airstrikes there. In early June, there were only about 200 American troops in Iraq manning the Office of Security Cooperation. But Muslims jihadists aren’t just beheading Pearl, Foley, and Sotloff, but are chopping off the heads of men, women, and even children. They’ve marked the red stamp of death on Christian homes and basically saying we know who you are and if you come back, you will get killed. That’s why we’re saying this is a Christian holocaust within our midst and the world community cannot turn a blind eye… They are absolutely killing every Christian they see. This is a genocide in every sense of the word. They want everyone to convert and they want Sharia law to be the law of the land. Here’s why Muslims sink to the unimaginably barbaric method of beheading. Have you ever heard Obama rhapsodizing about how lovely the sound of church bells ringing; or referred to the Bible as “holy”; or quoted again and again from the Bible; or lauded the Judeo-Christian western civilization? The church he attended in Chicago (Rev. Wright’s) was more Black liberation theology than Christian. For every Christmas since he became president, Obama had NEVER gone to church on Christmas Eve or Christmas Day. Even slacker Christians who don’t go to church on Sundays, manage to go on Christmas Day. The beheadings of Foley and Sotloff were met with silence from the Obama White House. In fact, President Ebola ignored a shouted question about Sotloff as he left on Sept. 2 for his flight to Estonia to attend the 2014 NATO Summit. Retired U.S. military officers and a former secretary of defense have spoken out against Obama, but this is the first time that a still-serving officer is openly critical. And not just any officer, but the 4-star commandant of United States Marine Corps — a significant indicator of the profound alienation of the military from their commander-in-chief. Thank you, Gen. Amos, for speaking the truth. Three years after U. S. troops had withdrawn from Iraq, finally ending America’s war and occupation (2003-2011) of that benighted country, our soldiers will be sent there again. This evening, June 16, 2014, after a weekend of golfing and political fundraising in California, President Lucifer declared, in a letter to Congress, that U.S. ground troops “equipped for combat” are being sent to Iraq. The troops’ “only purpose” is to protect US personnel and the US Embassy in Baghdad from the ISIS militants — and not join in the fierce fighting raging outside the Iraqi capital. Blah. Blah. Blah. In so doing, Obama directly reversed what he had said merely 3 days ago. Last Friday, he clearly said that while the U.S. will “do our part” to help, no troops will be sent to Iraq. About 160 American soldiers are already in Iraq, including 50 Marines and more than 100 Army soldiers. Some of those soldiers have only recently arrived. Under tonight’s authorization, the U.S. will put an additional 100 soldiers in a nearby third country where they would be held in reserve until needed. The POS did not give a deadline for the troops’ exit, only that the 275 soldiers will remain in Iraq for as long as they are needed to protect US interests. The White House says the U.S. military personnel are entering Iraq with its government’s consent. Meanwhile, Secretary of State John “snake-tongue” Kerry says Washington is “open to discussions” with Tehran about military cooperation. Iran has hinted that it is prepared to cooperate with the United States, whom Iran has called the Great Satan, to shore up the beleaguered Iraqi government against the savage ISIS jihadists. Iran already has sent 2,000 advance troops to Iraq. Kerry also said U.S. unilateral air and drone strikes against the ISIS “may well be” an option. Last Saturday, June 14, U.S. Defense Secretary Chuck Hagel ordered an aircraft carrier moved into the Persian Gulf. Today, unnamed Obama administration officials with access to the latest U.S. intelligence on Iraq told Fox News it “appears likely/probable” that ISIS militants got hold of U.S.-made Stinger missiles from Iraqi army bases they have taken over in recent days. The Stinger missile is a shoulder-fired surface-to-air weapon that is used against aircraft. Iraqi intelligence officials said ISIS fighters managed to take control of two big weapons depots late last week holding some 400,000 items, including AK-47 rifles, rockets and rocket-propelled grenades, artillery shells and mortars. A quarter of the stockpiles were quickly sent to Syria in order to help ISIS militants there. In addition, after taking over Mosul, the second most populous city in Iraq, ISIS is now the richest terror group in the world from looting US$429 million and a large quantity of gold bullion from Mosul’s central bank. Iraq is spiraling into anarchy and civil war. The Iraqi government has all but collapsed, its 300,000 troops fleeing their posts in the face of rapid territorial takeovers by the brutal ISIS (Islamic State of Iraq and Syria) militants who are fast advancing on the capital Baghdad. Oil industry analysts are warning the turmoil in Iraq could reduce the flow of Iraqi crude and send gas prices soaring in the United States. Meanwhile, Russian tanks are rolling into Eastern Ukraine in support of the separatists. A San Antonio Air Force base, a California Navy base, and a makeshift detention center in Nogales, Arizona have become temporary shelters for children and youths caught crossing the border without their parents. Here in Amerika, an unprecedented tide of unaccompanied children and criminals are pouring across the MEXICAN border, at a rate of more than 35,000 a month into Texas alone. The human tidal wave of illegals pouring across the border is spurred by newspapers and television stations throughout Central America falsely reporting that amnesty will be theirs if they can just make it through the Mexican border — and that the time to do it is now. But there hasn’t been a word from the White House or U.S. embassies urging families in Honduras, Guatemala or El Salvador not to send their children alone through Mexico’s merciless badlands infested with cartel criminals to reach the U.S.
Not long ago, Sen. Jeff Sessions of Alabama, a foe of illegal immigration, stated that based on evidence he’d seen and conversations he had with lawmen, there appeared to be an ongoing political campaign to destroy law enforcement at the border — something the former border agents called an effort to create “a failed state” on the border. If so, it’s a page straight out of the Cloward-Piven theory President Obama was so influenced by as a community organizer and at Columbia. Cloward-Piven Strategy is a strategy of manufactured crisis. First proposed in 1966 and named after Columbia University sociologists Richard Andrew Cloward and Frances Fox Piven, the “Cloward-Piven Strategy” seeks to hasten the fall of capitalism by overloading the government bureaucracy with a flood of welfare demands, thus pushing society into crisis and economic collapse. And what’s the POS’s response to all this? Like Emperor Nero who fiddled while Rome burned, Barack Obama is off on another vacation while the world falls apart. The POS at the Standing Rock (Sioux) Indian Reservation on Friday (June 13). A USA Today/Pew Poll from January 2014 shows that Americans now believe by a 50%-38% margin that war against Iraq and the subsequent U.S. occupation (2003-2011) was stupid. And the events of the last few days in Iraq are proving those Americans to be right. 4,487 of our soldiers died for nothing. 32,226 of our soldiers got wounded, some having lost their limbs, for nothing. More than $845 billion of taxpayers’ money was spent for nothing. On top of it all, Christians are fleeing from Iraq, knowing full well what life under the ISIS would mean. Under Saddam Hussein, Christians at least lived in peace in Iraq. But there isn’t a Christian left in the city of Mosul today. Zenit.org reports, June 11, 2014, that speaking to the Catholic charity Aid to the Church in Need, Mosul’s Chaldean Archbishop Amel Nona gave a graphic account of the Islamist take-over of Mosul and the people’s desperate struggle to flee to safety. Nona said he thought Mosul’s last remaining Christians had left Mosul that until 2003, had been home to 35,000 faithful. The Christians are among 500,000 thought to have fled Mosul, which was overthrown Tuesday, June 10. That event is now followed by news of militant attacks on the Iraqi city of Tikrit, 95 miles north of the capital Baghdad. The archbishop, who in the ensuing crisis sought sanctuary in Tal Kayf, a village two miles from Mosul, described how the local community was doing its best to provide for crowds of people flooding out of the city and into the surrounding Nineveh plains, where there are a number of ancient Christian villages. BBC reports have described ISIS ambitions to create an Islamist caliphate spreading from northern Iraq across to northwest Syria. From ISIS-controlled regions in Syria have come reports of Christians being asked to pay the Islamic Jaziya tax and pressure to convert to Islam. Many thousands of Christians have fled the region.